It contains two distinct, yet related styles of game play. Half of the game is played in a side-scrolling manner where you must fight against gangs of thugs, similar to Kung Fu, while the other half is played in a one-on-one tournament fighting style of game play. The game presents each type in an alternating fashion. In order to receive the true ending of the game, the player must play through the game once, successfully revealing several hidden fighters who contain one of the stolen scrolls, and then play through the game a second time, repeating the feat of collecting the scrolls from hidden fighters, in addition to revealing hidden crystal balls from the side scrolling stages. In an unexplored region of China wrapped in mystery, Ryuhi, a boy, was born and brought up in high mountain tops. There he received instruction from his wise teacher, Juan. Though he was young, he made himself a master of Kempo. 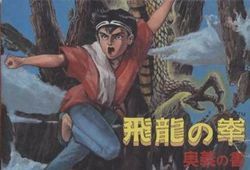 One day, his teacher Juan was attacked and robbed of the Secret Scrolls of Hiryu-no-Ken, of which he was the author. Ryuhi possessed the 6th volume of the Secret Scrolls, the Shingan-no Sho, or book of the mind's eye which Juan had managed to save. Ryuhi begins his journey to Shorinji in compliance with Juan's last request. Gengai, the bishop of Shorinji welcomed the little Ryuhi, regarded as one of the titans of Shourinji Kempo. Six years later, they received a letter of challenge from the Tusk Soldiers, a mysterious organization of enemies of the Shorinji. Ryuhi is determined to take part in the upcoming "World Tournament of Contact Sports" as a representative of Shorinji. His desire is to prevent the Tusk Soldiers from becoming champions of Contact Sports at the tournament. Ryuhi heard from Gengai that in truth it was the Tusk Soldiers who attacked his teacher and robbed him of the Secret Scrolls. As he leaves for the World Tournament, his thoughts are on his teacher Juan and keeping the fighting spirit burning. This page was last edited on 4 January 2014, at 22:46.